The administration of President Nicolas Maduro estimates that 30% of goods intended for the Venezuelan market, much of it in subsidized food products, is illegally being diverted and smuggled into Colombia to fetch far higher prices or is being sold on the black market inside Venezuela. The government considers the flow of contraband as part of an "economic war" against the Bolivarian project because it contributes to the episodic shortages of some of the country's basic commodities and gives rise to illegal price gouging. The profits from the sale of contraband are huge. According to economist Fernando Travieso, "if you take a Venezuelan food product and sell it on the other side of the border, you're talking about a profit of 20-30 times its value." To fathom the extent of the problem, one would have to imagine a caravan of trucks constantly moving goods out of Venezuela into Colombia, including hundreds of tons of foodstuffs and the equivalent of about 100,000 barrels of oil per day. The Venezuelan—Colombian joint anti-smuggling campaign was initiated on August 11, 2014, and is meant to address the contraband problem along the frontier zone, while the Venezuelan authorities also attempt to track the movement of commodities from the point of origin to the point of sale. Venezuela's Executive Vice President of the Republic, Jorge Arreaza, who presides over the Anti-Contraband Committee, and the Head of the Strategic Operational Command of the Bolivarian Armed Forces (Ceofanb), Vladimir Padrino López, have given an update on the campaign as of last Friday. Venezuela's military and police reportedly have confiscated 4,732 tons of food stuffs, 858 tons of animal feed, 2,763 tons of goods considered "strategic", as well as more than two million liters of fuel since the anti-smuggling effort began in earnest in August. These efforts also have augmented Venezuela's ongoing drug interdiction operations. Venezuela and Colombia are clearly attempting to build an impregnable wall against the illicit movement of food products, medicines, fuel and other goods from Venezuela into Colombia. According to Padrino, "There has been effective coordination with Colombian authorities in a spirit of mutual respect and cordiality." There have been a number of large-scale seizures and disruptions of a dozen well organized mafias that control much of the illegal traffic in contraband. For example, on September 16, Venezuela's coastguard reported the interception of more than 521,000 liters of fuel being illegally transported aboard five fishing vessels, resulting in the arrest of 28 persons. These operations are taking place on land , air and at sea, in the country's interior and along the frontier zone with Colombia. A recent poll by Hinterlaces indicates that 63% of Venezuelans approve of the government's struggle against contraband and 52% percent approve of the biometric system that keeps tabs on what consumers are buying. The government expects the continuing cooperation of the public; this is facilitated by a phone number for citizens to call to report any diversion of commodities or other irregularities. 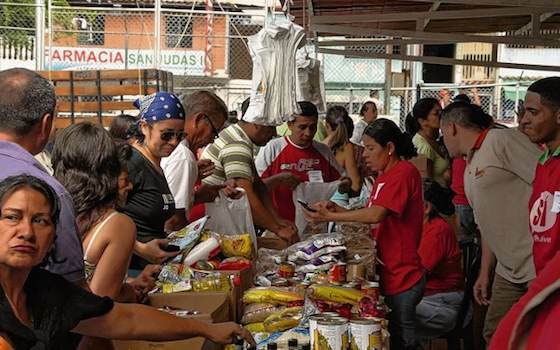 Restocking store shelves with diverted goods, providing open air market sale of more than nine tons of food per day (Misión Alimentación) at "solidarity prices," and increasing the import of basic commodities is expected to alleviate some of the shortages in the coming weeks. Part of the government's long term solution to foodstuff supply is to attain food security and food sovereignty by supporting small and medium sized agricultural production units as well as ensuring that food imported for sale in Venezuela remains there. Note: Translations by the author of government officials' statements are not official. "Venezuela Progresses in Battle Against Contraband"